Australian food producers are spending up to $50,000 to be certified organic by Chinese authorities to crack the burgeoning middle-class market of the Asian superpower. But many companies have baulked at risking the money because of the complex, unwieldy and expensive process to earn Chinese certification, Australian Certified Organic has said. The Chinese government refuses to recognise international standards, including Australia's organic benchmarks, the company's certification manager Michael Baker said. The group is lobbying the federal government to engage China in talks to achieve certification equivalency that will boost economic activity between the countries. The process on home soil costs $2000 on average for medium to large companies. Mike Brown, a winemaker at Gemtree Wines in McLaren Vale, used a Chinese investor's help to gain the Chinese organic stamp of approval after spending $50,000 in April. His business quickly quadrupled. Jue Chen, a senior business lecturer at Swinburne University, said food safety concerns were spurred by a series of food scares, the worst being the death of six children who had consumed baby formula laced with melamine five years ago. ''It's the rising middle class in urban China, and demand will increase for important organic products,'' she said, adding Australia was perfectly placed to play a major role with 12 million hectares of organic farmland compared to China's 3 million hectares. Bruce Symons, the chief executive of Organic Dairy Farmers of Australia, said after gaining Chinese certification five years ago, exports of long-life milk to China had grown by 20 per cent to 30 per cent a year, with sales nearing a million litres this year. The company, which controls three-quarters of the organic milk market, is planning to sell organic baby formula because of the insatiable demand. The percentage of baby formula in total milk powder sales to Asia has grown from 25 per cent four years ago to nearly 50 per cent last year, figures from Dairy Australia show. Laura McBain, chief executive of Bellamy's Organic, began exporting organic baby powder in 2008, after spending $50,000 for Chinese certification. It was an extremely difficult and very expensive process but it has reaped the rewards. Alister Ferguson, export sales manager for Arcadian Organic and Natural Meat, said two Chinese certifiers had recently travelled to rural Queensland to conduct tests at three of the company's cattle farms. He hopes all 45 Arcadian producers in NSW and Queensland will be certified soon, despite the frustrating process. 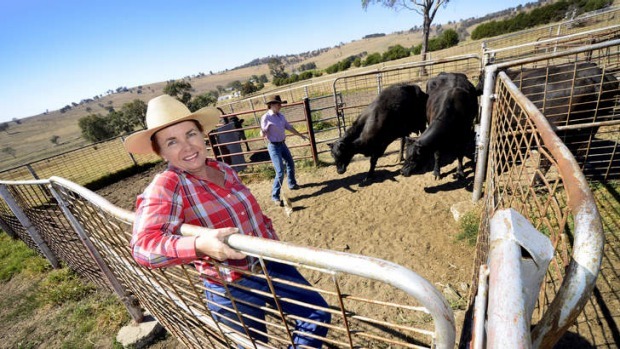 Cattle farmer Sheri Fogarty, from Woolbrook, near Walcha, is among them. She hopes she will be among the next lot of beef producers to get the certification. ''[The inspectors] are reinventing the wheel. Our standard has been around for nearly 30 years,'' Mr Ferguson said. But he says it's worth it. ''Our biggest market is the US and that took us eight years to build. We think sales to China will match that within just two years,'' he said.